In April I decided to apply to be a VE with the ARRL VEC. Reason that I want to be a VE is that at some point (after obtaining my extra class license), I would like to help out with testing hams. Sort of a way to give back. 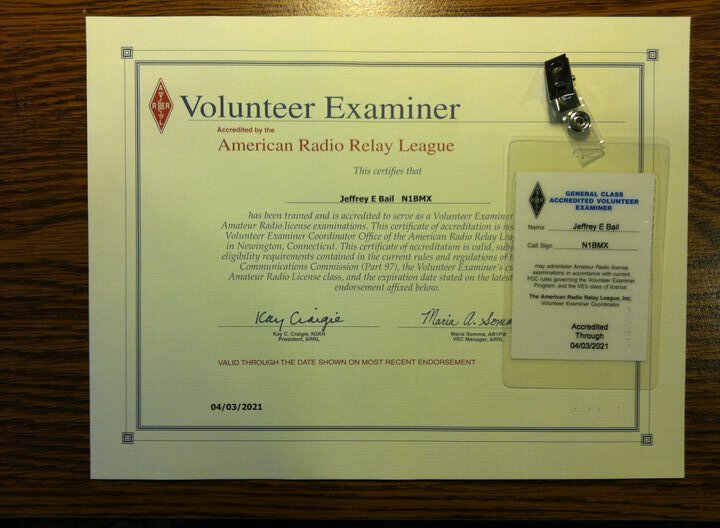 The process of becoming a ARRL VE is actually quite easy. All you need to do is to go to the ARRL VE Website, Download the manual, Download the application and question form, Read and understand the manual, fill out the application, answer the questions using the manual, either mail or scan to PDF and e-mail the application with the completed questions to the ARRL. According to the ARRL VEC, they will check your application and answer sheet, make sure you meet the requirements and issue you a certificate and VE badge that must be worn at VE Sessions. They will not tell you how many you got right or wrong and expect a wait time from 3 to 6 weeks. What ARRL does is hold onto the applications so they can print and mail everything at one time. From what I was told is that they print everything towards the end of the month so if you apply around that time, it could be in the next months pool. After that time hopefully you will get one of these. So if your part of a VE Team in the Pioneer valley MA and/or Northern Hartford county CT that uses ARRL VEC and need an extra VE. Depending on the schedule, I could help administer tests. Please use my contact page. At the time I was writing this I passed my element 4 test and now have an extra class license. Once the FCC ULS updates I will tell the ARRL VEC of my upgrade and will carry around my license until I get a sticker or new badge from the ARRL. Edit (6/15/2011) – I can’t believe how many people are googling for the answers to the VE questionnaire. It’s not really that hard if you think about it. All of the answers are IN the manual. If you’re trying to answer the questions without reading the manual, it’s going to be a lot harder. I also think that some of the questions are worded in a way so you have to think about it and form your answer based on what you thought. It’s not a copy and paste kind of test. Next Next post: Ham Radio… IN 3-D!